Carbon Poker Review - Casino Answers! Carbon Poker is a lot of fun, it really is. It has cool features such as running it twice and rabbit hunting in cash games and late registrations for tournaments, which makes it a lot of fun to play at Carbon Poker, especially as some poker sites can be far too serious. It might not be the most glamorous poker room, or have dozens of big names promoting it, but Carbon Poker brings some fun back into the game, which, for me, is the most important thing. With the leading names in online poker offering more and more games seemingly by the day, the up-and-coming poker rooms need to be on the ball and offering a huge variety of games for their users. Now, Carbon Poker does try to offer a huge variety of game choices. If you’re a fan of Texas Hold ‘Em, Carbon Poker is perfect for you. There are enough tables of Limit, No Limit and Pot Limit to keep even the fussiest Hold ‘Em fans happy. And if you fancy a change of game, well, Carbon Poker offers Omaha in both its high form and also hi-lo. There is also a section devoted to Stud, so you can play 7-Card Stud, Razz, 7-Card Hi-Lo and 5-card. But Carbon Poker also has 5-card Draw, Triple Draw and Badugi games on offer. Then, on the poker front, there are also mixed games available, but not just HORSE. Oh, no, there is HORSE, HOSE, SHOE, HA, HO, HAR and RASH. And if you’re wanting to try something different, you can get away from the poker tables at Carbon Poker and play blackjack, roulette, Caribbean stud and video poker when you have one bad beat too many. The main problem here is that there’s nothing innovative away from the game selection. Sure, there’s a great choice of games in the traditional sense, but when you have other poker rooms out there putting new twists on the old classics, it just feels like Carbon Poker is missing a bit of a trick not trying something new. The games on offer have been available to play online for years and it does feel like stepping back in time a bit with no innovation here. Plus, the niche games, while nice, aren’t as varied as some other poker rooms. I mean, there’s no OA, OE or SE, while you can play those games elsewhere, which is a shame. So, while the game selection is fantastic for Texas Hold ‘Em players, fans of other games aren’t as well catered for at Carbon Poker. Carbon Poker’s software is very basic. It’s almost like nothing has changed in online poker in a few years at Carbon Poker. It’s the type of software a lot of us have played in years ago and will no doubt play on in the future. While there’s nothing terrible about Carbon Poker’s software, it just feels very basic. And perhaps the most annoying thing about it is that you can’t customise it to any great degree. The fact is that poker is poker and we can play it with nothing but numbers and letters on a screen, but we all like to play it in the best looking way possible and Carbon Poker just doesn’t let you do that. That being said, there are some nice features in the Carbon Poker software, with little features such as rabbit hunting and late registration for tournaments, which is nice. It’s the little things like that which does put the Carbon Poker software just above average, as although they’re becoming more common throughout the online poker world, they are still nice touches. There is nothing really bad to say about the Carbon Poker software, but the fact is that there’s nothing really special going on. If you want to just sit down and play poker with likeminded players, then you can’t really go wrong. However, if you’re looking for a poker room that has software all the bells and whistles, you might want to look elsewhere. Carbon Poker has a 100% match bonus up to $600, which is a considerable size, especially when you look at other poker rooms out there. It’s a great bonus which means that your first deposit will be matched by the poker room, all the way up to $600. So, if your first deposit is $250, Carbon Poker will match that. You won’t receive the bonus straight away, but you clear it by playing at the poker tables (both ring games and tournaments). The bonus is cleared through VIP points in $5 increments and while not incredibly easy to clear, away from the micro-stakes, it’s not too hard. VIP points can also be used to purchase great gifts in the Carbon Poker store. New depositors also get 14 days’ worth of entries to the $500 new depositors’ daily freeroll. Carbon Poker has a fun rewards program. The VIP store is fantastic, where you can buy anything from jewellery to electronics with your accumulated VIP points. It’s one of the most impressive stores I’ve seen from an online gaming company. It’s seriously impressive. There are other promotions from Carbon Poker, such as their Money Tree promotion, Weekend Warrior, King of the Hill, Marathon Man and the Carbon Poker Triathlon. They’re all nice little features that keep you coming back to play more and more, trying to top their leader boards. This is the real problem for Carbon Poker if you’re looking for anything other than Texas Hold ‘Em. While the traffic for Limit Hold ‘Em and NLHE is great, everything outside of this is relatively poor. In fact, a lot of games, while on offer, have no real traffic at all to speak of. The tournaments aren’t always the busiest, which is a bonus when you compare it to the huge fields of the bigger competitors, so taking down a tournament or two shouldn’t be too difficult with a smaller field! We think it’s neat to time travel into the past, and look at where a poker room was at one point, and where it is now. We have this review of Poker.com which would eventually turn into Carbon Poker. This was written in 2006. May Promotions: Over $35,000 in freerolls every week, including a $100 freeroll every 3 hours. 50% sign-up to $100 bonus. Poker.com Software: Poker.com’s software requires and uses Macromedia Flash 8, and offers a very different and relaxing feel to it’s poker room, with lobby music and a very slick layout. Their lobby layout takes some getting used to at first, although is very visually appealing and easy to navigate. They also offer the option to hide play money games, and you can navigate the different limits with tabs. The software is highly customizable, although the background of the tables is very distracting, and the shape of the actual cards isn’t a rectangle, and is hard to get used to. Also, if you open up more than one table you cannot have it on the same screen as the other table, as it is all hidden by a tab that you have to click. The option to be able to view all tables on the screen at once, as well as able to change the backgrounds, would really enhance this software. Poker.com Game Variety: Poker.com offer Texas Hold’Em and Omaha, although Omaha games are far and few between. They excel in tournaments though, with a huge variety of tournaments ranging from guaranteed tournaments to low-buyins, shorthanded, full ring, freeroll etc, and are a great site for the beginning tournament player. Poker.com Fish Factor: A domain like “poker.com” obviously attracts quite a few fish, and the games can be very soft. The players are generally passive too. Poker.com Bonuses: 50% to $100 sign-up bonus. $1 paid for every 150 comp points, as well as a $500 freeroll daily for all first-time depositers. Poker.com also run a lot of promotions in regard to freerolls. You can also use your comp points to earn exclusive bonuses. Poker.com Freerolls: Poker.com offer 5 $100 freerolls daily, as well as many other freerolls which you must earn entry to. They also have a lot of $1 tournaments. Poker.com VIP Club / Loyalty Rewards: Playing ring games and tournaments earn comp points at Poker.com, where you are able to trade these in for exclusive bonuses and freeroll tournaments. They’re also going to be opening up a store in the very near future where you can purchase items with your points, as well as a special players club. Poker.com Support: Poker.com offer 24hr e-mail support, with responses within 30 minutes. 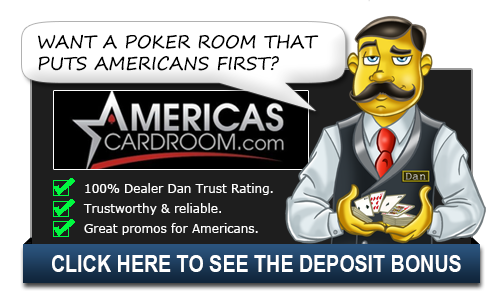 Dealer Dans Bonus Rating: Poker.com’s emphasis on tournaments, as well as focusing on the lower-bankrolled players, specifically in regard to available tournaments, earn them an extra star. The Carbon Poker lobby which allows you to search for whatever game you want to play with ease. Texas Holdem at Carbon Poker with a simple graphical layout allowing you to multi-table with ease. Pot Limit 5 Card Draw is one of a variety of other games available at Carbon Poker. There are a decent amount of tournaments at Carbon Poker for a wide range of bankrolls. However, there are very few tournaments on offer outside of Hold ‘Em. While there are a few tournaments in other games, the focus really is on Hold ‘Em. There are, however, nice touches like ladies’ tournaments and a large number of freerolls. There are lots of guarantees for Carbon Poker’s tournaments, which is a definite plus. But if you are looking for a wide selection of tournaments for niche games, Carbon Poker might not be the place for you. If that’s not the case, get yourself over to Carbon Poker, as there are tournaments going off all the time if you’re a Texas Hold ‘Em winner. Carbon Poker offers both e-mail support and a live chat feature which operates 24/7. The support staff are great and have helped me a few times. I’ve also had help via e-mail which was swift and courteous, so definitely no complaints in terms of help given and the timeliness of it. If you ever have the need to contact Carbon Poker, we would love to hear about your personal experience as well.